This is me, climbing back up to the face of the Earth from which I have fallen in the few weeks. It’s shocking to see how stuff in real life, or behind the scenes of this blog, can have such a huge impact on whether or not I can successful string a post together. This last week (or two) has been a good example of that. I’m learning to let go a bit and give myself some room for imperfection. You know what they say, right? Imperfection is the flavor of life. Ok, I doubt anyone actually says that, but I like the sound of it. I got up this morning, earlier than the rest of my family (which is a rare event) and came down to the kitchen to sit with a cup of coffee and just soak in the quiet. I used to think I thrived on chaos, everything crazy and unpredictable. 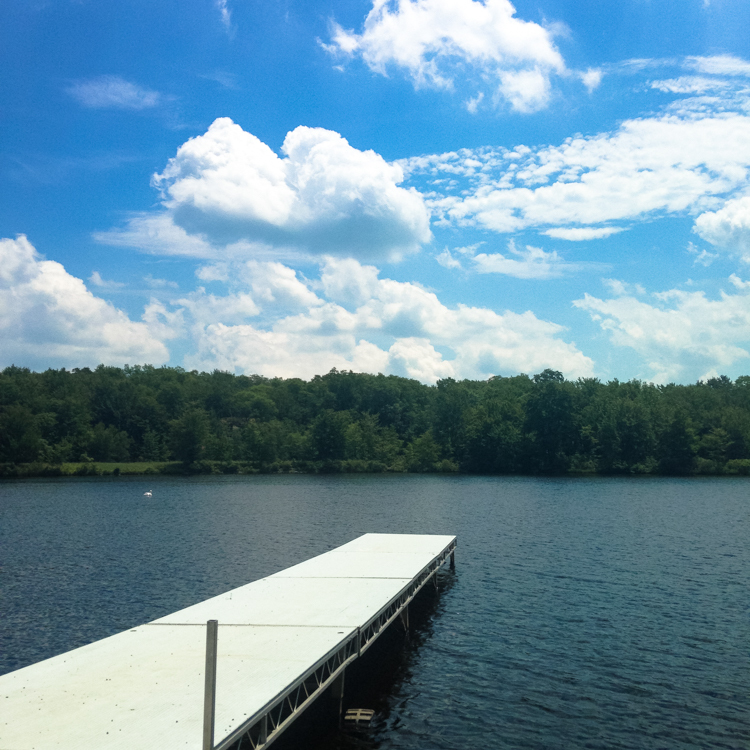 Now, I’m realizing that my mind and body need some calm to stay truly happy. I can’t do everything and frankly, I shouldn’t try. That’s what I’ve learned so far this Spring. There have been opportunities that I have wanted to be a part of, at church and the kids’ school, but due to other commitments, I haven’t been able to participate. Having to say “no, sorry, I can’t come or join or help” is very hard for me. I’m a people pleaser and always want everyone to be happy and it’s hard for me when I know that I’ve disappointed someone. Well, I am slowly finding out that I can’t do everything, help everyone, be everywhere. I can only do so much, and what I do do (Friends reference, anyone?!) I need to do to the best of my ability. What I can’t do, I need to be kind but firm about saying, “no”. This is hard stuff. This is important stuff. I feel like my mind is slowly being decluttered and I’m loving the feeling.
. I couldn’t even tell you now how I came across this book, but I believe it involved a rabbit hole of internet comment reading where someone left a link to it. It would have popped up eventually in my life because it’s a #1 best seller and everyone is talking about it, but I’m glad it came around when it did. I am hesitant to ever state that something has changed my life. Basically I’m too cynical. There is no way some book is going to help me clean my house and, most importantly, keep it clean. If you feel like this, keep reading! Since Christmas I had been feeling insanely stir crazy. My house was a disaster with stuff covering every single surface. Closets held contents that hadn’t seen the light of day in 5 years. Bins in the basement that held who knows what. I started feeling like we would qualify for some sort of hoarder reality show and it was getting to me. I have always been a messy person – not dirty, let’s clarify – just messy. When I vent to my mom about how C is always a tornado of mess with her Legos and constant crafting all I get in response is a laugh. And I get it. I was the same. exact. way. C is a mini version of me as a kid, but even more fabulous. And by fabulous, I mean messy. Well, even I have a breaking point apparently and it hit at the ripe old age of 32 and I just freaking couldn’t take it anymore. We had to do something about the way we lived and it had to happen fast. We have been talking about moving for a while and had the long term goal of putting the house up for sale next year, but knew that we needed to do some serious decluttering before that could happen. Not just to help the house sell, but for us. I don’t want to pay movers to move things we don’t want, need or love anymore. That’s just money down the toilet. 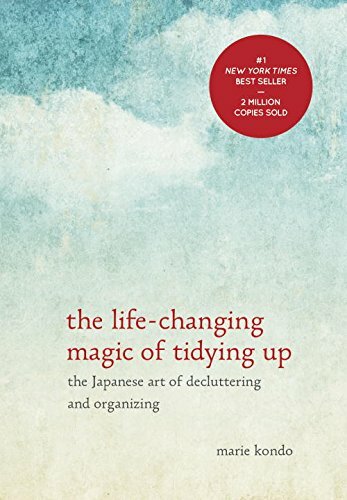 So, I checked the audio book version of The Life-Changing Magic of Tidying up out of my library and got to listening. The only thing I had heard about it at that point was that you needed to keep an open mind. Don’t let yourself eye roll or be skeptical. Listen to what she has to say, and then try it. I listened to the book 4 times. I’m not even kidding. And then I got to decluttering. I have never had anything flip a switch in my head as fast and as thoroughly this book. I look at my possessions in a whole new light. When I go shopping, I use Marie Kondo’s (Konmari Method) criteria of “Does this bring me joy?” when deciding on whether to buy something new. So simple, but life-changing. As a household, we got rid of 20 13-gallon bags of clothes, about 250 books, 3 large garbage bags of papers to shred or recycle, 7 large pieces of furniture, 1 van full of toys to donate plus 3 large garbage bags of toys to throw away. After that I pretty much lost count. I have had van fulls of donations weekly (since the beginning of March) that were full of dishes, clothes, household decor, books, toys and the list goes on. I swear I can hear our house sighing with relief as we’ve purged. But the key to this method is not mindless purging. It’s thoughtful, going through of each item and holding it in your hands and asking yourself, “does this spark joy?”. Some items have been hard to get rid of, even knowing that it brought us no joy. Perhaps it was a deep fryer that we bought two years ago and never used or a monogrammed gift we received at our wedding that has been sitting in basement for 10 years. Some things will be hard, and some will be easy. I urge you to read this book if you are looking to get your house in order. Marie Kondo’s method of sorting by category and not room is also so simple, but I believe is the key to the success. We started this process in March and it’s taken us until this weekend to be fully complete. For a time, the house seemed a bit chaotic while we gathered things from different categories, but very quickly we could feel the relief. I could walk by a closed closet and know exactly what was in there without looking. The items had been sorted thoroughly and each item that was kept was given a permanent home. No more floating lunch boxes that clutter the kitchen counter on the weekends because they don’t have an assigned spot. No more photography props on the basement floor in front of the prop shelves because there simply is no room to put them. I have never felt this happy with the state of my home. Ever. In fact, it is because of this book and it’s results that we were able to finish the few painting projects that we’ve been putting off and are now going to put our house up for sale this week instead of next year. Yeah, life-changing indeed. Our house is adorable and over the last few years it’s been totally updated. But now that it’s decluttered, you can finally see it. And it’s beautiful. The decision to leave is bittersweet. Our entire married life has been in this house. We brought our babies home here, seen them grow, had first days of school, birthdays, anniversaries and I’m so grateful for it. I love this house, but it’s time to move on to the next adventure. And because of the joy and love that this book has brought to me, I want to share it with you! You must be a US resident to qualify. Please be sure to use your current email address when signing in to comment, that is how I will contact the winners. Jennifer Ross – She has a bunch of great videos for several of the different categories in the book. The videos are long, but show her entire process of decluttering. I have found these very helpful! 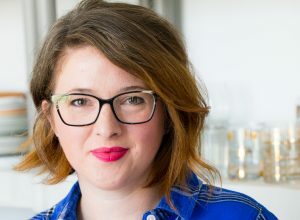 Hey Eleanor – I came across Molly, from Hey Eleanor, on Twitter and love her posts on the KonMari method. She’s honest and entertaining and found her insights both amusing and totally accurate. This Pinterest board is full of awesome visuals of clothes, folding methods and before and after photos. I was a slacker and didn’t take many before and afters, so this is a great way to check out some examples. I can’t tell you all how much I appreciate each and every one of you that comes here to JT to hang out, read my ramblings and check out my recipes. You guys are the best. The best, the best. In fact, next week I am putting together a reader’s survey to get a little more insight into what you would like to see here on Jelly Toast. This will also have a very sweet giveaway, so be sure to stay tuned for that! In the mean time, have an awesome weekend and I’ll see you guys soon! This post is not sponsored. I adore this book and decluttering method and wanted to share the happiness with you! I’m looking forward to decluttering my home of old paperwork that has piled up over time. Yes! Paperwork is possibly the most tedious category to declutter, but it feels so good when you’re done! I want to de litter our bathroom the most. I have way too many beauty items! Thanks for the kind words, Christina! It’s funny how in times of transition how you feel compelled to get things organized and in order. I totally understand. Thanks for stopping by and good luck! Hi there! This book sounds perfect! I desperately want to declutter my bathroom! Way too much makeup and bath stuff. Some are no longer favorites and some just needs to be tossed like mascara. Having moved a year ago, my house isn’t overwhelmingly cluttered, but it’s on it’s way and I want to head that off. I want to make some space and learn how to *not* fill it with clutter. I would like to streamline my possessions in advance of my upcoming marriage this year. Having possessions in two places is too much because out of sight out of mind and the cost of storing things I don’t use is probably not worth it. I think having a place for those “miscellaneous” items that don’t seem to fit anywhere would be what I’m most looking forward to! I read that book over Christmas break and felt the same way – but think I need to read it again because I’ve fallen back into some bad habits. I’m proud of you for blessing someone else with so many of your things! And moving!! That’s huge! My basement play room! These kids have too many toys! I want them to help me also! I’m looking forward to decluttering our clothes. We have so many things from up to 15 years ago still piled up in the basement. Also, the children’s artwork from the last decade. It’s taking up the majority of a closet in the kitchen. I WOULD LOVE TO HAVE THIS BOOK SO MUCH. I HAVE STRUGGLED WITH GETTING RID OF STUFF FOR YEARS. MY HEALTH IS GETTING IN THE WAY OF KEEPING UP WITH EVERYTHING. I NEED TO MAKE MY LIFE LESS CLUTTERED BEFORE MY HEALTH GETS ANY WORSE. I FORGOT TO SAY THE ROOM I NEED TO TACKLE FIRST. THAT WOULD BE MY BEDROOM. MY BEDROOM TENDS TO BE THE DUMPING GROUND FOR THE REST OF THE HOUSE. I want to declutter my clothes the most. Decluttering ….clothing, pantry, office, kitchen cabinets, laptop files, for starters. I really enjoyed your review of this book! I’ve been hearing so much about this book, and it’s all amazing! I actually picked it up in Target the other day and spent about 20 minutes reading it in an aisle before putting it back. Oops. We just had a garage sale where we got rid of a lot of stuff, but I’m really looking to adapt an entire lifestyle of less “stuff.” I know this will be even more relevant once the baby stuff starts pouring in! This book sounds perfect for getting ready! I’m looking forward to decluttering my craft supplies. I hang onto things because they might be useful for a future project, but then I can’t remember what I have! I think that my bedroom would be an ideal place to start! !! I’m a clothes-horse! !! It would be a lot easier donating than adding another closet! Hope I get to read this helpful. life changing book! I think we all struggle with decluttering at some point in our lives. Some choose to deal with before it happens while others like to avoide it at all costs. Once it’s avoided, it can become too much and often stressful thinking about how to deal with and when. I used to be very organized, but sadly that phasof my life ended when i was in college and had my own place. Last November I moved down south and left everything at home in my moms basement while i took a suitcase full of clothes. While I’ve managed to declutter the current place after putting if off for so long I now have to go home the Wisconsin this summer and decide what to do with my life that is in boxes. I’ve tried numerous time to reduce that life in boxes but now i have to face the truth and once and for all find what I truly cannot bare to see go. I do t want to pay to ship what im not going to use, put in storage and will def not have room iny current place for anything. If love to listen the suggestions that you found helpful so i can finally move on with my life, since it’s obviously something that is just dragging me down. Im so happy you finally moved on too! I am looking forward to going through my clothes. I have a few totes full of clothes- different sizes, seasons, etc. I NEED to declutter my kids’ toys, which are taking over the house! My whole house. I was just complaining about all the clutter today. My mom has listened to this book and LOVED it. I never stop hearing about it. I really want to declutter my pantry & my closet. Those two always seem to become untidy soon after I have cleaned them up.